Photo and Video thanks to Gigi. 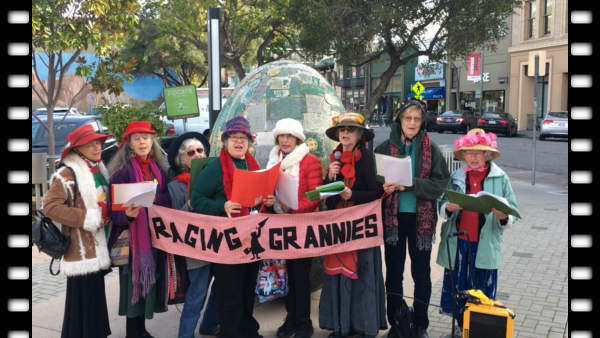 Continuing a long history of protest during the holiday season, the Raging Grannies sang fractured holiday carols in front of the sculpture Digital DNA and elsewhere in Lytton Plaza in downtown Palo Alto again this year. They called for an end to war and no war toys for Christmas; in a song to the tune of Santa Claus is Coming to Town, they called out Republicans for their recently passed giant tax scam. Video here is a song they sang to the tune of Jingle Bells titled "Save the Egg", referring to the endangered artwork of artist Adriana Varella in Lytton Plaza. Last month the Public Art Commission of Palo Alto voted unanimously to remove Varella's artwork from the city’s public art collection. Digital DNA is a seven foot tall egg shaped sculpture made of recycled circuit boards. It imparts a political message—that technology generated by Silicon Valley has a far-reaching impact. It conveys that modern technology can enslave us, and reminds the viewer that technology is also used for warfare. The sculpture speaks for itself on a website created by Friends of Digital DNA. It says, "..[the] Palo Alto Censorship Committee consisting of members of the Palo Alto Art Commission, the developer’s cabal that owns most of the property in downtown Palo Alto and members of City staff, staged a Kangaroo Court to decide that I should be terminated within 90 days of being notified of the verdict...The Trial itself was straight out of Kafka. I did not know the charges, I was not allowed to cross-examine witnesses, nor was I allowed to make any kind of meaningful defense."